Eye drops are administered prior to your laser treatment. The laser treatment is performed in the laser room at Marin Ophthalmic Surgery Center., right across the hall from our San Rafael offices. From the patient’s perspective, the treatments are really simple. You sit in front of a microscope like the ones we use in the clinic for examination except that the laser is connected to the microscope. We use the Lumenis Selecta Laser for our glaucoma treatments. For narrow angle glaucoma, we use the laser’s “YAG” mode. For open angle glaucoma, we use the “SLT” (Selective Laser Trabeculoplasty) mode. Our instrument also has capability for thermal laser treatments (especially useful for retinal problems) using visible alser light. The glaucoma procedures take 5 to 15 minutes. Laser Trabeculoplasty for open angle glaucoma can be done with either “thermal” laser (ALT) or “cold” laser (SLT) at MarinEyes. SLT is the most recent development in laser treatment for this condition. It can help some patients who are sensitive to side effects from their glaucoma eye drops and also some who are not adequately controlled on medication alone. When effective, the cost of this treatment is much less than the cost of ongoing use of glaucoma medications. It would be unusual for a person to wind up worse off because of the treatment. SLT is a Medicare-covered procedure that is clinically proven to reduce or eliminate the need for topical glaucoma medications, potentially saving you thousands of dollars in prescription medication costs. Narrow angle glaucoma is typically treated with laser rather than medication or incisional surgery. The Lumenis laser in YAG mode is our preferred treatment. The laser makes a minute hole in the iris, releasing the fluid buildup behind and deepening the narrow angle. Regurrences of narrow angle are quite infrequent after this treatment. High pressure or other reactions are very infrequent. This contrasts with the gravity of either an attack of narrow angle glaucoma, or the insidious progression of chronic angle glaucoma in untreated eyes. YAG Laser Iridotomy is a Medicare-covered procedure, proven effective for treatment of narrow angle glaucoma. Minimal Postoperative Care: You will be given post-laser eye drop instructions and a follow-up pressure test is scheduled for 2 hours after, then another appointment for 1-4 weeks later. You will likely continue any pre-operative medication and may be given additional drops to use temporarily. There is no limitation on your activity. Occasionally there is a high pressure detected at the 2 hour visit that needs additional medical treatment. Little if any discomfort is expected. Minor ache responds well to Tylenol. 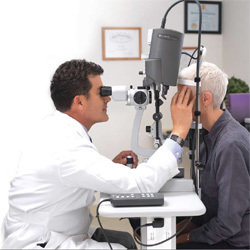 The success rate for glaucoma surgery varies with the nature and stage of your glaucoma. In best cases, the success rate for intraocular pressure control approaches 90%, but many cases eye drops will still be needed. Laser Trabeculoplasty (either ALT or SLT) for Open Angle Glaucoma controls the intraocular pressure in about 75% at one year and 50% at five years following laser treatment in the best cases. This is usually considered a temporary treatment about equivalent to the effectiveness of a single eye drop medication. The SLT treatment may be repeated, but the results are less effective after the initial treatment. By contrast, the ALT procedure is limited to one 360 degree treatment. Laser Iridotomy for Angle Closure Glaucoma cures or prevents Angle Closure Glaucoma in 95% of patients. Further treatment depends on whether permanent closure has already developed, and upon the possible co-existence of a component of “open angle” glaucoma that will need to be treated with eye drops. As with all types of surgery, complications are possible. Every effort is made to minimize risk, but serious or long-term complications including failure to achieve results, inflammation continued need for medication, permanent loss of vision and need for further surgery can occur. Discuss this with your surgeon before consenting to surgery. The alternatives to laser treatment for glaucoma are medication, incisional surgery or hopeful observation.